This ready-to-give Gourmet Gift Set includes our two most versatile and best selling spice blends. It's perfect for the person who wants... or needs to explore new flavor profiles. It comes packaged in an attractive gift box and includes Chicago Steak and Chop and Fisherman's Wharf. Chicago Steak and Chop The ultimate windy city blend of sea salt, pepper, garlic and red pepper is great for beef and pork. Sugar free. NON GMO Project Verified. Fisherman's Wharf This versatile blend of lemon, sea salt, garlic, pepper and onion brings seafood and veggies to new levels. Sugar free. Gluten free. NON GMO Project Verified. Your Culinary Wingman Urban Accents always has your back in the kitchen. Our focus is on quality, natural, small batch blendedand creative flavors that we love to serve to our own friends and family. Find easy-to-use directions and suggestions on each label or package. Add some spice to your life! 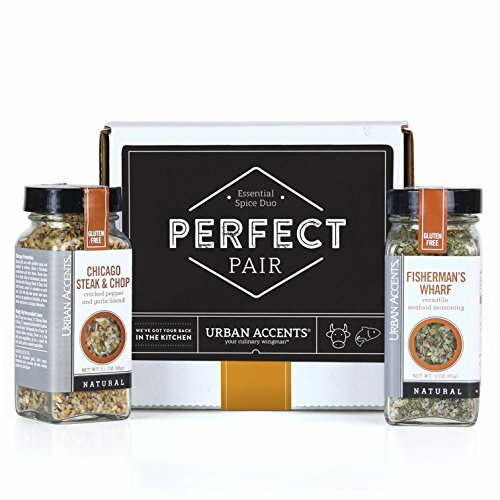 Whether it's to wish someone congratulations or a happy birthday or a summer holiday, or time to amp up your own cooking game; it's the perfect time to buy Urban Accents' PERFECT PAIR essential spice duo gift set. THE FOODIE'S TOOL KIT: This ready-to-give Perfect Pair Gourmet Gift Set includes our two most versatile and best selling spice blends, essential for every kitchen. CHICAGO STEAK AND CHOP: Sample the ultimate windy city blend of dry spices: sea salt, pepper, garlic & red pepper - an ideal meat rub for beef, pork and portobello mushroom. FISHERMAN'S WHARF: A versatile blend of lemon, sea salt, garlic, pepper & onion. Balanced, vibrant, citrusy with herby lemon flavors - perfect spices for fish fillets, scallops or mussels. GREAT GIFT SET: A perfect addition to a great wedding or shower gift, this Perfect Pair spice gift set makes an ideal gift basket or hostess gift for your favorite foodie.